Powers/Abilities: The Man-Elephant seems to possess no powers but for a devious and nefarious mind. He does have access to such technology as his "mentation augmentor" which can transform normal earth elephants into humanoid elephant men as himself with human-level intelligence and a change in color (possibly a side effect). History: (Sensational She-Hulk#51)- The Man-Elephant is the creation of Marvel Comics, the publishers and distributors of numerous fictionalized comic book series and graphic novels based on the actual costumed crime fighters of their reality. 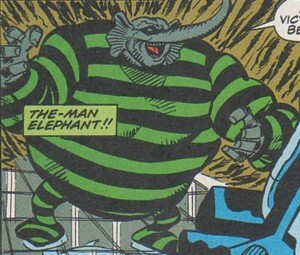 Marvel's adaptation of the She-Hulk's encounter with the original Man-Elephant a few years prior was perpetuated and exaggerated a bit by their writing staff. Under unknown circumstances, both their version of a more sinister Man-Elephant and their version of the She-Hulk came to life and confronted the real She-Hulk. Appearing at Marvel Comics to discuss their treatment of her past, the She-Hulk clashed with both her exaggerated counterpart and the Man-Elephant. With technology from his alternate world, the Man-Elephant converted the elephants in New York City's Bronx Zoo into humanoid versions similar to himself to back his schemes of conquest, but even with their accelerated mutation, they retained their peaceful and docile personalities albeit a bit confused over their transformations. Inciting them into violence, the Man-Elephant led them against the She-Hulk doppelganger released by his escape from the Marvel Comics pages and defeated her. The true She-Hulk then arrived on the scene backed by Marvel Comics' Tommy the intern in an animal costume calling himself the Gopher. Fleeing in terror at the sight of him, the humanoid elephants of the Bronx Zoo stampeded over the Man-Elephant and left him to be captured. The real She-Hulk then returned the Man-Elephant back to where he came from along with the other She-Hulk. Comments: Created by Scott Benson, Tom Morgan and Brad Joyce. This entry is a more canonized scenario of Sensational She Hulk#51 as it might have actually occurred in the confines of the Marvel Universe. 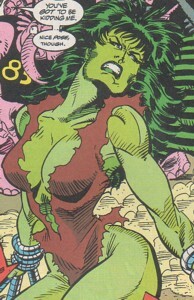 Much of the She-Hulk's second series revolved around her "interacting" with her "readers" and poking fun at the concept of herself in a comic book. Much of this was explained later by claiming Jennifer often imagines herself as a character in a comic book. Also, since the issue begins with Jen in bed (talking to Editor Ren�e Witterstaetter no less), the whole issue could just have easily have been a dream, but that might not be the case since Tommy the intern (The Gopher) appears later to join her against Electro. Another scenario could be that Jen traveled back in time to her original ordeal with the first Man-Elephant, but numerous contradictions would make that not the case. Conceivably, Earth-9356 refers to the reality within the comic books within the Marvel Comics of the Earth-616 timeline. If the concept of an animated cartoon villain seems odd, don't forget there is an animated cartoon hero called Slapstick. There are also Mojo's animated celluloid images called the X-Babies. 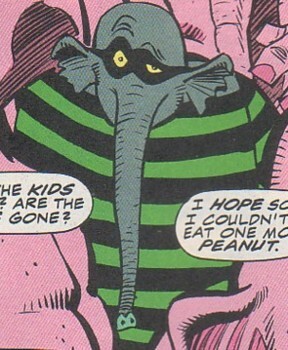 While the possibility of the Man-Elephant and the She-Hulk doppelganger being creations of Mojo exists, there is also a possibility that the Man-Elephant is a denizen of Spider-Ham's Cartoon-verse or even Howard the Duck's Duck-world, which also includes versions of sentient dogs and mice. (Both these worlds could be one and the same, but there's no evidence of that.) If such a world exists, it might be the home of the animal versions of Nightcrawler and the Vanisher seen in Bizarre Adventures#27. Actually, the concept of elephants being afraid of mice is an urban myth unless it is just another side affect of the Man-Elephant's cartoon machine. The She-Hulk Doppelganger is an animated sentient version of the fictional She-Hulk created in the pages of Marvel Comics in New York City. She had all the powers of her real life counterpart including superhuman strength, stamina and resistance to injury. Speaking in a stilted first-person manner as the Incredible Hulk first did, she wore an animal skin loincloth and refused to recognize the real She Hulk. The two of them got into a fight as the Man-Elephant escaped the comic book. Trying to stop him, she was captured and rescued by the real She-Hulk who returned them both to their native world.